After postponing its downtown campus presentation, UCF is moving full steam ahead in efforts to raise private funds. After postponing its downtown campus presentation to the Board of Governors in early November, UCF is moving full steam ahead in efforts to raise private funds. At a Focus on Excellence Breakfast Wednesday morning, President John C. Hitt said UCF needs to raise $20 million by spring 2016 in private donations to secure the downtown campus. Once the funds have been raised, he said, UCF will present a revised plan for "a vibrant, full-service downtown campus for approximately 7,700 UCF and Valencia students." More than 5,000 students will come from UCF, and construction is expected to be finished by fall 2018. Hitt expects the Board of Governors meetings and subsequent legislative proposal to go smoothly, as UCF is working closely with the board in order to meet its expectations. 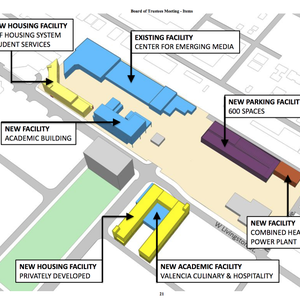 Costing a total of $60 million, the downtown campus will be funded in three $20-million parts: state funding, university resources and private donations. Orange County commissioners have already committed $3 million to the project, and Valencia College's Board of Trustees plans to contribute $2 million, UCF spokeswoman Christine Dellert previously told the Future. The programs offered at the downtown campus were chosen carefully and will greatly benefit from the campus’ location, Hitt said. Students will benefit from easy access to businesses, government offices and nonprofit organizations where they can hone their professional skills and make professional contacts. He said the organizations the students interact with will benefit from the creativity and energy students will bring as interns and employees. He listed the following majors as being strengthened by the move: health care, communications, social work, digital media, health services, administration and legal studies. Originally, UCF requested $58 million in state funds for the campus, and in June, the Florida Legislature granted $15 million of it. But it was later vetoed by Gov. Rick Scott.